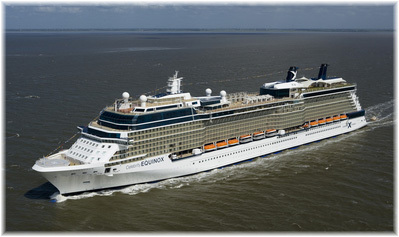 The Celebrity Equinox left Southampton last Friday on her maiden voyage to the Mediterranean. But in the two weeks before she sailed, Celebrity put on a remarkable show to the UK travel trade. During this show, the big guns from head office told us that with these new ships there were two things they were trying to be. One was "stylish not trendy" and the other was "elegant not formal." These are just a couple of the touchstones that guide the new Celebrity, as they begin to take bookings on the third of these Solstice class ships, Celebrity Eclipse, which will be based in Southampton next summer. So let's have a look at this second of the five new Solstice ships to come from the shipyard of Meyer Werft at Papenburg. There was no question that Celebrity pulled out all the stops to host the UK trade, offering a series of five 1- and 2-night cruises from Southampton and hosting about 5,000 travel agents and 2,000 clients, as well as a good number of suppliers and media people. Not only that, the hosts were three big guns: Richard Fain, chairman and ceo of parent company Royal Caribbean Cruises, Dan Hanrahan, ceo of Celebrity Cruises, and Robin Shaw, managing director of Celebrity's UK office. In fact, Fain admitted that the costs for this exercise were "unconscionable," although there was good reason for it. So why such a powerful cast? Well, one thing they told us on our two-night cruise was that Celebrity is aiming to take 5% of the UK cruise market next year. To do that they will have to book 75,000 passengers, and combined with sister company Royal Caribbean's Independence of the Seas, which already sails from Southampton, this will present huge competition to P&O and Princess and to some extent to Cunard as well, not to mention the likes of MSC and NCL over at Dover. Celebrity ships have cruised from UK ports in the past, but this will be the biggest program ever and the first time since Chandris ran the Australis and the Regina Magna on cruises from Southampton that they have had such a serious presence in the UK. Yes, Celebrity is going back to its Chandris roots, although it doesn't say as much as the earlier ships handled the £10 a head emigrant trade to Australia before going into cruising when that stopped. A much more upmarket Celebrity will now be looking for UK business. If you liked the previous decoration on Celebrity ships, which have always been somewhat refined, you will find the decoration on Celebrity Equinox a bit more futuristic, like a "Popular Mechanics" vision of the future. There is lots of architectural sculpture and metallic embellishment throughout the public areas and the carpets are swirly rather than comforting. In some areas, such as the bar outside the Murano extra tariff restaurant the swirly carpets, the swirly painting of the columns and the artwork and unique light fittings can tend to overwhelm than relax one. Unusual metallic lighting fixtures are offset in many areas of the ship by art, particularly a good part of the Galaxy art collection that was removed when that ship became Mein Schiff with its German-market associate TUI Cruises. Personally, I feel more at home on the Century and Millennium class ships but then Celebrity are probably trying to attract a younger more trendy crowd. As one of its Hollywood interior designers, Tim Magill of 5+ Design, said, the idea was that she should look more like a dinner jacket than a ball gown, if you follow that logic. There are three particularly large areas on this 122,000-ton ship that can carry over 3,000 passengers that I like to call Hold numbers 1, 2 and 3. Hold number 1 is the three-deck high show lounge, a very impressive room indeed, which features the usual Celebrity stage elevator that can raise a piano or a set from beneath the stage. Hold number 2 is the atrium, which contains a tree suspended in mid-air and open glass elevators on each side of the hold, onto which faces a library where it must be difficult to remove the books from shelves that are two decks high! And Hold number 3 is the double-deck dining room that has a balcony on the top level. Unlike the Century and Millennium class that have dining rooms at the stern, the Equinox main restaurant has no stern view. The galleys have been located there instead, a throwback to the old Horizon class. One must suppose that the ride is a little nicer in a rough sea, but it is a shame that the only aft-facing restaurant is now the extra tariff Tuscan Grill (Celebrity call it the Tuscan Grille but a grille is what one finds on the front of a BMW or a Studebaker). Hard deck surfaces, somewhat like stone or tile flooring, have been used in some parts of the ship. Particularly in some of the more open areas where large balconies overlook the rooms below, this can mean a lot of noise. It seems to be a current trend for bars and restaurants to have many hard surfaces that create echoes but now this has been taken to sea. 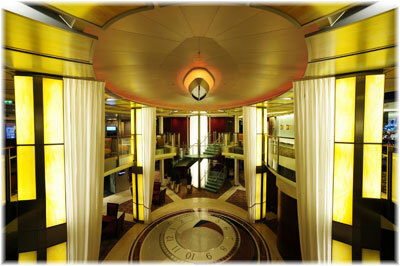 Not for the first time, however, as some Carnival ships have the same hard decks in public areas. Presumably these are easier to clean and to maintain but they do affect the noise level and at times one needs to look around to find a quiet place to relax in. This is particularly true of the Martini Bar and the Coffee Bar. One needs to search out Michael's Club further aft to find somewhere a quieter. Ironically, the wine tasting lounge called Cellar Masters directly opposite the noisy Martini Bar, does offer a more tranquil setting, as does the Passport Bar down the stairs on the other side of the ship. In this case, the elevator banks operate as a sound barrier. One last thing, although all the Celebrity executives apparently tried out every style of new chair that is used on board the Equinox, someone forgot the stateroom couches, which are very hard! The exterior hull of these ships is quite mould-breaking and many have found them to be striking, or even handsome. One of the most interesting views, however, is above the boat deck, where seven stories of balconies rise above the sea like some cliff side luxury beach resort. In fact, however, the ship is not that far removed from a 1,400-room resort hotel in that 85% of her cabins now have private balconies. Below all these balconies is a promenade along the boat deck and at the forward end of this on each side are private deck areas where one can relax in a good old-fashioned steamer chair with cushion and read a book. But there are only forty-two of these steamer chairs on a ship that can carry more than 3,000 passengers. The vast majority of deck furniture is the sun loungers and other chairs surrounding the three pools up top. Oh, and up forward on top there are some nice loungers as well, somewhat marred however by the sound of bouncing balls coming from the basketball court in the middle. Unique is her stern, however, which slopes down from the top towards the sea. Celebrity has added what it calls an interceptor, a yacht-like transom that wraps around the ship's stern, effectively lifting her hull slightly to cut the ship's drag as she cuts through the water. Her hull was in fact designed by yacht designer Martin Francis, who succeeded another yacht designer, the late Jon Bannenberg, who had worked with Celebrity since the line's first ship, the Horizon of 1980. 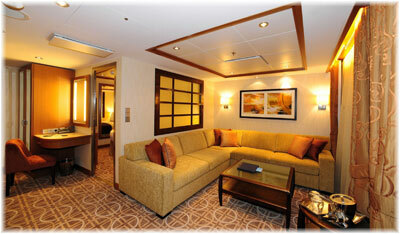 All Celebrity ships have therefore been designed with yachts and mega-yachts in mind. 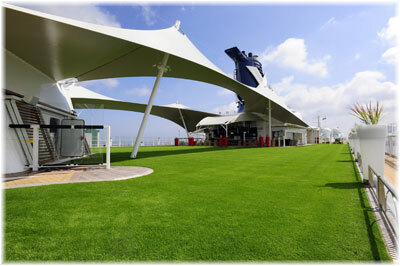 The Lawn at the top of the ship is interesting but one wonders how practical it really is. And the glass-blowing display is good for one viewing and then you're done. It has created the advantage, however, of the ship being able to make its own naming bottle, which was smashed against one of her funnels rather than the hull, as is the usual practice. Speaking of usual practice, and just as an aside, the lifeboat drill on these new ships is held without life jackets. This will be the procedure on the new Oasis class ships of Royal Caribbean as well, where they have gone as far as considering removing life jackets from the cabins and stowing them all at the lifeboat stations. The Equinox also joins a return to two funnels, something that goes back to ocean liners such as the first Queen Elizabeth and the France, to name just a couple. More recently, all of Disney's ships have been designed with two funnels as well. But in the case of the Solstice class, both funnels are aft and they are real, each one serving a separate engine room. This arrangement gives the ship 100% redundancy, meaning that in case of trouble in one engine room, the other one remains intact. But Why Must The Gym Face Forward? It must come from all of us travelling in aircraft these days, with no forward view and windows facing only sideways, but why is it that so many ship designers under-rate forward-facing lounges in large ships? The Queen Mary 2 is probably the best ship in the world for this, with its Commodore Club, Library and Atlantic Room on three different decks. The only forward view on Celebrity Equinox, however, is from the Sky Observation Lounge. But one deck down, one really must ask oneself why on earth people on treadmills, especially treadmills that face the side of the ship, should have such a splendid view of the sea when they could easily be located in the bowels of the ship? Outside the gym, there is an open deck area that faces forward and this would be a particularly good place to be on entering port, but is marred by speakers playing the very loud techo-rap that is played in the gym. This lack of imagination is not exclusive to Celebrity's designers as Carnival ships have their gyms forward as well and the Sea Princess even has a cafeteria there. Still, it is a real shame to waste such precious space on a fitness area. Crew matters in more ways than one, but the most important is in ensuring that people come back as repeat customers. Celebrity takes great pride in its crews and to host two weeks on a new ship, they ensured there was no lack of experience from those on board Equinox. This showed in the consistency of the service that was offered. To ensure this level of service, about half the crew came from the Solstice and 45% from other Celebrity ships, leaving only a small proportion of the crew as first-timers. No doubt this was helped by the fact the Celebrity had only very recently delivered the Galaxy to Germany. While interviewing several Equinox crew members to see how Celebrity kept them happy, they were quite happy to talk about their employers. The new Solstice class ships have a crew of 1,253 that is accommodated over three decks of well-designed crew cabins, and on top of the normal crew bar they have their own crew disco and even a crew casino, although this consists of machines and not table-top gambling. But one of the biggest responses we got was that Celebrity offer six-month contracts with six weeks off whereas one former Holland America employee told us that he had had to sign one-year contracts with them. Things like this make a big difference when it comes to crew being able to see family and get a rest every once in a while. Here are some more facts about the new Celebrity Equinox. The first is that the top of the ship features more than 200 solar panels that can produce enough electricity to power 7,000 LED lights. The second is that the acres of windows on board have been specially chosen to reduce heat transfer from outside the ship and thus save on air conditioning. The third is that a special non-toxic silicon coating has been applied to the hull to reduce resistance and save fuel. The fourth is that water consumption has been reduced through the use of river rocks instead of ice in the buffets, reduced-flow dishwashers in the galleys and shower heads that require less water. Not only is this a green ship but the competition must be green with envy and will have quite a fight on their hands in the UK market with her sister ship next year. And I haven't even mentioned Aqua Class or Blu or Silk Harvest yet! 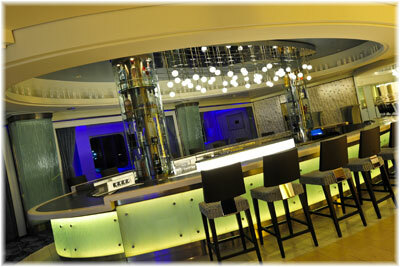 Overall, the ship is bright, new and spacious, the crew and service fantastic and the food consistently excellent. Celebrity has not missed a trick since its parting with Michel Roux and still maintains, if not exceeds, the very high standards that it set for itself from the beginning.